Jeanette Vuuren (Jansen van Vuuren) lives in Adelaide, Australia with her husband and two children. Her educational background as a qualified teacher with a further diploma in Remedial Education and over fourteen years teaching experience, gained in South Africa, the UK and Australia has given her a deep empathy and understanding for the special needs of students. Working with Kindergarten to Year 11 students, with diverse backgrounds, in different subject fields as a mainstream, special needs and remedial teacher, helped her adapt her teaching strategies to meet the individual needs of students. She especially aims to write educational and story books, including the relevant concepts applicable for specific age groups, integrating learning content with different curriculum, subject fields and life lessons. While staying at home when her two children were young, her passion for writing started when she was doing research on remedial education and learning disabilities, creating integrated lesson plans for differentiated classes. She pursued her passion for writing in 2009 to assist a student who was not able to sound out words, but made up her own story by looking at the pictures. Jeanette has published her first series on honeybees and is in the process of expanding the series with teachers' resources, fun activities and other series and will have it available in paperback soon. 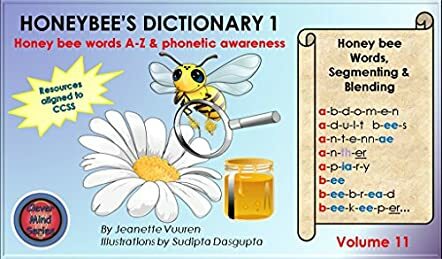 Honeybee's Dictionary 1 Volume 11: Honeybee Words A-Z & Phonics Awareness (Honeybee Series) by Jeanette Vuuren is one of the twelve books of the Honeybee series. It is an educational book for children aged 5 to 7, which introduces kids to various aspects of education and learning. The main focus in this book is to teach children honeybee words and introduce them to the world of honeybees. The educational theme and the vocabulary will teach young readers many new things. It is a useful book for teachers working with small children. This educational book introduces children to new concepts in an interesting and interactive way. The functional word list is very useful. The bright illustration that go with the words add to the appeal of the book and make the concepts clearer. By the time children finish this series they will have an in-depth knowledge of honey bees, the food they eat, how they communicate, and many more aspects. The book targets a younger audience and the short sentences and simple style help them understand the contents easily. Educational books like this make it easy for educators to teach children about new things, new concepts, and new words. This book will make a good bedtime story book. It can also be used in classrooms and libraries for read-aloud sessions and as a reference book for children of smaller classes. On the whole, this book, along with the other books of the series, is worth owning.